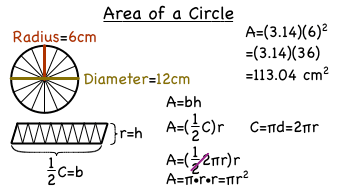 What is the Formula for the Area of a Circle? Did you know that you can figure out the formula for the area of a circle by first turning the circle into a parallelogram? It seems a little weird, but it really works! Watch this tutorial to see how it's done! Circles are a fundamental part of math! In this tutorial, you'll be introduced to circles and see the different parts of a circle such as the diameter, radius, and chord. Check out this tutorial to learn about circles! How Do You Find the Area of a Circle if You Know the Radius? If you know the radius of a circle, you can use it to find the area of that circle. Just plug that value into the formula for the area of a circle and solve. Watch this tutorial to see how it's done!